This time of year, apparently all it takes is two walnuts and a squirrel will squeeze itself into a space barely larger than itself (there were no mid-size traps available at Lowes). I put it out last night as the sun was heading down and when I got up half an hour ago, I found... success! Just released the critter into the arb. 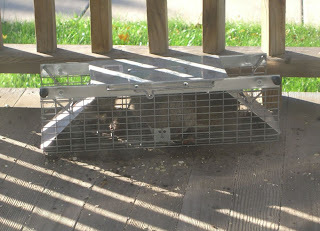 He was healthy enough to scoot from the trap to a tree 20 feet away in about .003 seconds, so I think he'll be fine. Now to fully patch that hole in the porch eave so this doesn't happen again. This task will be made much easier, I hope, by the fact that I FINALLY bought a jigsaw. After several trips to Jamie's without stumbling across a solid one for cheap, I caved and decided that fixing the eave, building a vent slot for the laundry room, etc, etc were more important than bargin hunting. I may have failed flea marketers everywhere, but at least my house will not have unnecessary holes in it this winter. Also done yesterday - ordered the shed, put up the second light in the hallway (thank you again, wire clippers!) and... something. I must have done something else yesterday. I need to keep two lists - things to do and things I've done. Yes, I realize this blog was supposed to be the latter.